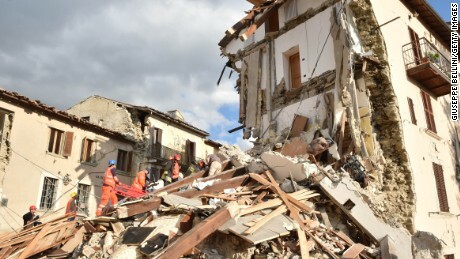 The death toll from yesterday’s earthquake in Italy has risen to more than 240 people, as rescuers continue to try to find bodies and survivors in the wreckage. Wednesday’s 6.2 magnitude earthquake was followed by hundreds of aftershocks with magnitudes as high as 5.1 and 5.4 as the town attempts to begin rescue and recovery efforts—more than 4,000 rescuers are working to clear rubble using heavy machinery and their bare hands. The worst-hit towns—Amatrice, Pescara del Tronto, Arquata del Tronto and Accumoli—were all summer vacation destinations, which makes the death toll even harder to track. According to BBC, rescuers have urged journalists and other on-lookers to leave Amatrice—the town with the highest death toll—because the town is crumbing. There have been small moments of celebration as rescuers have found a young girl alive in the rubble after being trapped for more than 17 hours and a dog being rescued as well.